Your trip begins in the far south-west of Portugal. From here you'll begin to explore the Sudoeste Alentejano e Costa Vicentina National Park, a haven for all kinds of cyclists and one of the most stunning national parks in Europe. How and where you ride is completely up to you but rest assured you will be on quiet, traffic-free roads. With options for dirt tracks, hidden trails, smooth tarmac roads and more, you'll be able to cycle wherever you like in this incredible region of Portugal. There is never a bad time to visit Portugal as it offers over 300 days of sunshine a year. The autumn months of September and October are a great time to visit. If you’re looking for some temperate winter sunshine, a warm Spring or Autumn cycle or a hot summer, this area rarely lets you down. Fly into Faro Airport and on the train or ask us for a transfer to your first hotel in Vila do Bispo. With an indoor pool and sauna, this is a great place to relax following your journey. This afternoon, we suggest strolling around the village and eating at one of the restaurants in the charming village. This morning, we will take you to the Fort of Sagres. Here, you will pick up your bikes and begin your cycling adventure. The bike will be set up for you upon arrival so you should be set to get going straight away. Ride to the old Fort or to one of the many beaches in Sagres before you continue onto Pedralva. Cycle alongside tarmac roads with views towards the stunning Cape San Vincente, the most south-western point in Europe before continuing north through vibrant fields into the village of Vila do Bispo. Ride on through eucalyptus forests and windmills before arriving at your destination for the night in Pedralva. Today is a short 25km on the bike. Begin with a gradual descent into the village of Carrapteira and take in the mix of tourists, surfers, fisherman and locals that come together in the central square. One of our favourite places to visit is the ethnographic museum ‘Museo do Mar e da Terra’. Spend some time here before joining up on the tarmac and gravel roads towards the Carrapateira coast. The abundance of beaches makes this a special place to ride and, if you visit during the summer, you can take part in the surfing lessons at the Praia do Amodo. Begin your return along dirt roads through the untouched hills. You will encounter one steep hill on the dirt road but this is the only challenging section on an otherwise relaxing and scenic ride back to your hotel. If you’d rather ride on tarmac, the route is only very slightly longer. Your day will begin with a steady 10km made up of a mix of descending and flat terrain. Stop in Bordeira, a pleasant village with a charming central pub, before you begin on a steep climb through open meadows and pine trees. Following 27km on the bike, you’ll then have the choice to add an extra 15km to your day by riding to the beach of Monte Clerigo. If you choose not to ride the optional 15km, descend into Aljezur where you will spend the night. This is a quintessentially Portuguese village. Explore the narrow valleys and castle ruins before finding somewhere to sit and enjoy a meal in the warm evening sun. Your hotel tonight is a modern complex with a swimming pool. Your ride will be 45km today if you choose to jump onto the extended route or 30km if not. Today begins once again with a scenic ride to the coast where the Praia Amoreira awaits. After a stop here, ride past Rogil and across the vast natural landscape made up of heather and pine groves. Stop for a coffee before jumping onto the ‘Historic Trail’. You can choose to ride along the Tarmac or on dirt tracks as you enter the authentic village of Odeceixe. Rest up here before cycling over the Algarve and Alentejo border. The last section of your day will be over farming country and into the town of Zambujeira where you will spend the night. If you have time, head down to the popular local beach, take a dip in the water and bathe in the sun. 32km agricultural ride in the morning between Zambujeira and San Teutonio. However, we recommend you spend a bit longer on the bike and ride to Odemira as you’ll get to experience the contrasting landscapes of the region. Along the banks of the rivers Mira and San Teutonio, you’ll get to observe the lively homes of otters, an exciting spectacle. Continue along wide dirt roads on the ‘Historical Trail’ through the countryside and amongst vibrant flower beds. Today you will ride 47km however, for a short ride and to spend more time on the beach, there is an option of a 32km route. 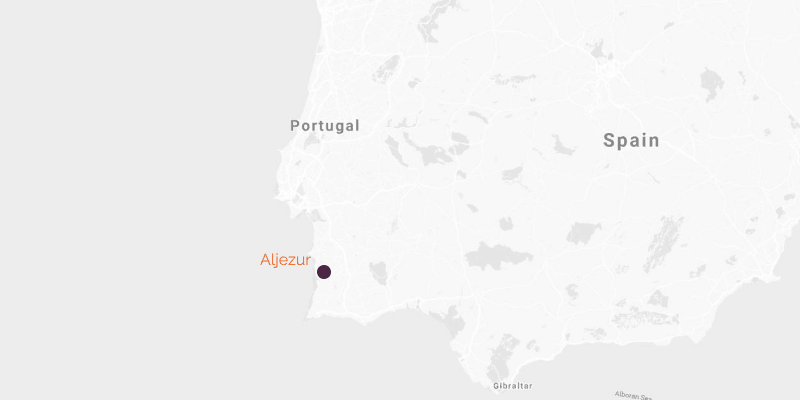 Your ride today will take you back to Aljezur on a route inland from the coast. Ride through flowerbeds and farmlands before a steep descent to the bridge of Odeceixe. Cross the bridge and ride alongside the river on quiet gravel roads through the Mediterranean forests. Climb 100m in 1km before returning once again to the plateau of Rogil on the way back to Aljezur. You will hardly have to pedal along the final stretch of this route. There is an option at the end of the day to drive to the Praia do Amoreiro and take in the incredible sunset once more before your trip ends tomorrow. Your Algarve and Alentejo cycling holiday will come to an end today. Transfer back to Faro Aiport if you are returning home. If you wish to extend your trip at this, or any other, point just let our cycling experience team know. The cycling season begins as early as March and April which offers cool Spring riding. The weather gets progressively warmer into May and June. The Algarve and Alentejo regions are hot in the summer and can be quite humid. This is tempered by the breeze on the coast so you can enjoy some excellent coastal cycling in the summer. Autumn is a great time to cycle in the Algarve and Alentejo regions. The summer heat has passed and the weather becomes cooler. The winter can become quite wet, especially in December, however temperatures are still good for cycling. Your cycling holiday meanders the tranquil west coast beaches where the only noise comes from waves lapping at the shore. Ride amongst pine trees, vibrant meadows and silent farmlands with a visit each evening to a lively and beautiful town in the Algarve/Alentejo regions. Make sure to spend time relaxing on the beaches and even try some surfing. The Algarve beaches are some of the most popular for surfers in Europe. This is the perfect cycling tour of Portugal’s west coast and can be tailored to all riders, ages and abilities. All hotels on this trip are selected due to their excellent location and unique services. Each room you stay in will be en-suite. If you would like to upgrade your accommodation or stay somewhere for longer, this can easily be arranged. Just let our cycling experience team know when you enquire. Your trip will be bed and breakfast but you can upgrade to half board if you prefer. Due to the days out on the bike, B&B has often been the best option as this ensures you have a lot more flexibility with your cycling and exploring time. The holiday is a self-guided holiday allowing you to explore Portugal at your own pace. We have hard copy routes available for you to follow but we recommend hiring a GPS and be guided from place to place with our preloaded routes. if you require more information about your ride prior to departure and a breakdown of the places to visit along the way, don't hesitate to get in contact with our cycling experience team. Your bike will be in great condition and we do our best to ensure you don’t have any mechanical problems during your ride. Our bikes are extremely well serviced and maintained but in the very unlikely event there is a mechanical issue with the bike (not including basic maintenance such as slipped chains or punctures), you will be provided with an emergency number for someone to come out and repair or replace your bike.